Another TOP TEN for Enchanted! Happy Celebrate Teen Literature Day! Every year, YALSA sponsors this event, which “seeks to showcase some award-winning authors and books in the genre, as well as highlight librarians’ expertise in connecting teens with books and other reading materials.” Celebrate Teen Literature Day is when the Teen Read Week website is launched … and when the Teens’ Top Ten nominations are announced! The Teens’ Top Ten is a “teen choice” list where every title is nominated and voted on by teens. The 2013 nominations have been posted on the YALSA website so that teens across the country can read them all summer; voting will take place Aug. 15 – Sept. 15 via YALSA’s brand new Teens’ Top Ten site for teens at www.ala.org/yalsa/reads4teens, and the winners will be announced during Teen Read Week in October. YALSA encourages librarians and library workers to visit the Teens’ Top Ten site to access resources, such as a free Teens’ Top Ten Toolkit, that will help them promote the titles all summer long to their teen patrons, so the teens are ready to vote in August. Sunday loves to write stories; the only problem is that when she reads them aloud, they tend to come true. So when a frog claiming to be a cursed human comes along, he asks her to do two things: to read a few stories that won’t harm anyone and to kiss him. When you kiss an enchanted animal — or in this case, a frog — the enchanted will return to his true self. What Sunday doesn’t know is that if she kisses him, her life will change forever. Click here for the full list of nominated books! 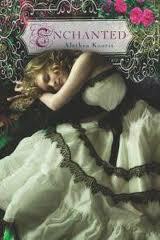 I am honored that Enchanted was named second on her list of six recent books with strong family ties. Hooray!! I highly encourage you to read the rest of the article here.